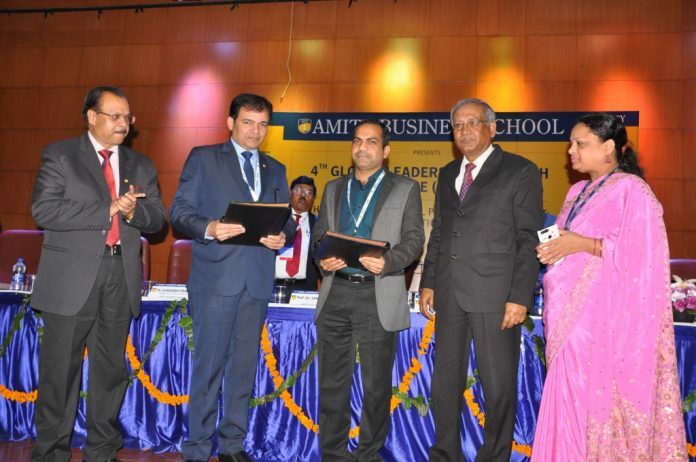 Amity Business School, the flagship institute of Amity University, Noida organized its annual research conference, 4th Global Leadership Research Conference (GLRC-2019) on “The Transformational Power of Enablement: Combining Innovation and Efficiency” from February 27 – 28, 2019. Prof. (Dr.) Sanjeev Bansal, Director, ABS and Chairperson GLRC-2019 in his welcome address deliberated upon the four areas of discussions viz Marketing, HR, Finance and Operations, which would take place . He also apprised about a new reform that Amity University was initiating in the form of Education 4.0, by providing a common platform to the industry and the academia. He exclaimed that “we want to shape our curriculum in such a manner which would facilitate the students to get in to the industry. We want to train our students in such a way that they meet the requirements of the industry”. Dr. Balvinder Shukla, Vice-Chancellor, Amity University, Noida said that leadership is not only limited to corporate world. We want to build a society with a pure and a healthy mind. 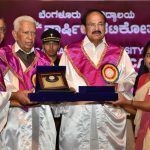 She averred that Amity University focuses on inculcating human values in society by constantly being involved in social work. She stressed on the importance of learning and said that she is sure that GLRC-2019 would help the students by lending them relevant experience. Dr. R.K Mitra, Advisor (Police), Ministry of Home Affairs said that today’s students are going to be the leaders of tomorrow. He said that according to him, innovation must be done based on an implicit set of values and it must serve mankind in general. Addressing the students, he said that apart from innovation and production, one must also focus on value creation. The students must be able to distinguish between problem and truth. He called upon the students, not to get intoxicated by success because it could be a tragic flaw and can make you arrogant and oblivious. Sh. Sundaram Prabhu, Chairman, Board of Supervisors, AZIZI Bank, Kabul and CEO, ConsulSyS (India) Pvt. Ltd. lauded the students for their ability to research. He said that if we want to have a transformational power and have an exponential growth, then we need to fully utilize the technologies and the resources that are available to us. He exclaimed that empowerment is a collective process and our actions must focus on empowering the youth, our colleagues and our subordinates. He told the students that success is a step by step process and if you are determined enough towards achieving success, nothing can stop you. Mr. Amit Dubey, Chief Security Architect, Tech-Mahindra apprised about the revolutions that have taken place in the automobile industry. Addressing the students, he said that creativity can play a huge role in escalating your careers. He said that India is expecting a need for around 3 billion server security professionals by 2020 and we are considerably lagging behind in these numbers. In order to reduce these shortfalls, we are participating in these conferences and trying to introduce new technologies to enhance the skills of the students. During the first day of the GLRC-2019, discussions & deliberations were held on topics such as Transformation of Financial Services: Redefining Value Enablers; HR innovation and change in the age of disruption, Value driven Marketing and Issues and over 75 research papers were presented by the scholars. Amity Excellence Awards were conferred upon Radico Khaitan Ltd, HCL Technologies Ltd and MakeMyTrip Ltd. on the occasion. Amity Business School also signed an MoU with Tech-Mahindra as Education 4.0 partner. Innovative Financial Practices: A Prerequisite for Emerging Economy, Disruptive changes- Maneuvering Role of HR in the age of disruption, Operational Innovation/Sustainable Operations Management an Quality Management, Marketing: Innovation and Efficiency; Role of Federations and Management Associations in Bridging the Gap between Academia and Industry etc.